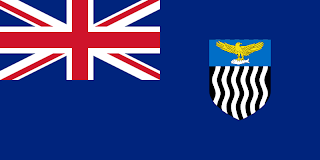 Zambia slowly fell under the control of the British during the late 1800's, and became part of the protectorate of Northern Rhodesia. Its Blue Ensign featured a shield of black and white stripes, topped in blue, with an Eagle clutching a fish. 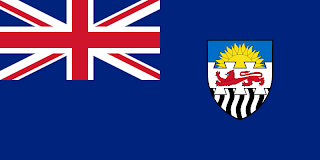 In 1948, after a referendum, to help with funding, Northern Rhodesia entered into a federation with Southern Rhodesia, and Nyasaland. The new Blue Ensign took elements from each shield. The black and white stripes from Northern Rhodesia, the lion from Southern Rhodesia, and the rising sun from Nyasaland. However, in 1963, the Federation was broken when each became separate, and independent from Britain. Southern Rhodesia became Rhodesia, and later, Zimbabwe, Nyasaland became Malawi, whilst Northern Rhodesia took its name from the Zambezi river, and became Zambia. Zambia has remained relatively stable ever since, and has seen its economy grow after periods of strain brought about by conflicts around them. 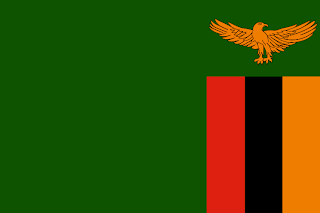 The flag of Zambia is a green field with 3 stripes on the fly, running vertically about two thirds the way up the flag. The stripes are red, black, and orange. 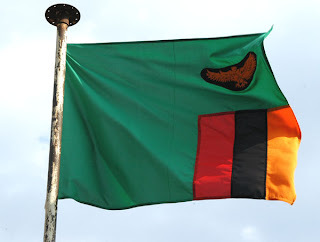 The orange stands for the mineral resources of the nation, the black stands for the people of Zambia, and the red symbolizes the struggle for freedom. The green represents the natural resources of Zambia. Above the stripes is a gold coloured eagle, representing the nations ability to soar over its problems. The flag underwent a minor alteration in 1996, with the shade of green being lightened.